This recipe is from Rachel Allen's lovely book Bake, which always seems to have easy, no-nonsense recipes when I need them. 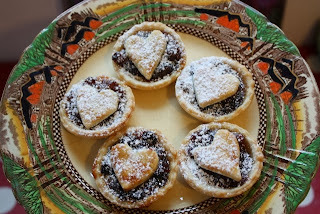 I love mince pies and was staring at them in Tesco this morning but resisted in favour of making some with Juno. Kids and baking are a great match when Mammy's in great form. Not so much today, but we got there :) And the mince pies are delicious. * On a floured work surface, roll out the pastry to 3 mm thick. * With a smaller cutter or heart/star cutter cut-out 24 lids. Re-roll the trimmings, if necessary. * Line the holes of the cake tin with the larger pastry rounds. Fill each base with a teaspoon of mincemeat and top with one of the smaller rounds or hearts. * Brush the tops of the mince pies with beaten egg. * Bake in the oven for about 13 minutes until pale golden brown. * Cool for 5 minutes before removing from the tin and transfer to a wire rack to cool. * Dust with icing sugar to serve.